FOOTHILL RANCH, CA--(Marketwired - Jan 20, 2014) - Applied Voice & Speech Technologies, Inc. (AVST), a leading provider of best-of-breed Unified Communications (UC) software, today announced that the newest version of its CX-E 8.5 UC platform features a new SIP integration with Cisco Unified Communications Manager. The new release extends AVST's leadership position in offering the broadest range of IP integrations to Avaya®, Alcatel-Lucent®, BroadSoft®, Cisco®, Microsoft®, Mitel®, ShoreTel® and Unify®. In addition to the integration, this version features new mobility and security enhancements. More than 30 years ago, AVST believed that interoperability was paramount to the success of its UC platform and a key component to their product roadmap. AVST set out with this strategy based on an understanding that most enterprise communications landscapes are made up of a collection of technologies from multiple vendors that have been acquired over time. To avoid vendor lock-in, protect legacy and future UC investments and enable best-of-breed UC functionality, AVST knew that interoperability was a critical component to an enterprise's UC success. "How do we make Microsoft, Avaya, Cisco, Google™, IBM®, etc. co-exist? It's a question we hear frequently," said Tom Minifie, AVST Chief Technology Officer. "Our UC interoperability is the 'glue' that enables enterprises to leverage existing and future technology investments across a rapidly evolving and multi-vendor UC landscape. We provide our customers choice, while delivering functionality that makes their work-life more productive and engaging." The new Cisco SIP integration comes on the heels of several recently announced integrations and certifications. Last month, AVST announced successful interoperability testing with BroadSoft's BroadWorks Communications Applications Server. The BroadSoft interoperability testing is one of several joint initiatives that AVST is pursuing to accelerate medium and large enterprise adoption of hybrid cloud-based UC solutions. In addition, AVST recently announced successful Mitel certification testing and Microsoft Silver Application Development integration competency. The new version of CX-E 8.5 also includes new mobility features, location support for iPhone®, security features that restrict forwarding of voice messages, and more. For more information, please visit www.avst.com. 1 Gartner Critical Capabilities for Unified Communications, Steve Blood, Bern Elliot, June 24, 2013. The typical enterprise communications infrastructure is made up of a collection of technologies from multiple vendors, acquired over time and never intended to work together. To maximize user and business productivity, while leveraging existing IT investments, interoperability is a must. AVST delivers the industry's most interoperable Unified Communications (UC) platform that brings best-of-breed voice, mobility and business process applications to the enterprise. Unlike virtually every other UC vendor, AVST does not constrain customers with a single vendor lock-in approach. In fact, it's the very opposite. By connecting new and existing technologies, AVST frees organizations from the constraints of a closed, single-source UC solution, unlocking the full potential of their communications infrastructure. Headquartered in Orange County, California, AVST maintains facilities in Seattle, Washington, Victoria B.C., Canada and the United Kingdom and has remote sales offices throughout the United States. 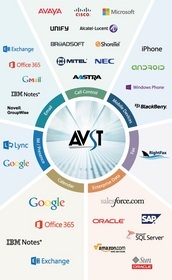 AVST's UC solutions are sold and supported worldwide by an extensive network of resellers and OEM partners. To learn more about AVST, our products and partners please visit http://www.avst.com or you can follow us at Twitter, YouTube, Facebook or LinkedIn. AVST delivers the most interoperable UC platform on the market, integrating to all the major call control solutions, email, mobile devices, presence engines, calendar, fax and business data.